Could I paint my ceiling blue like that million dollar home? I love this blue... I know what your thinking.... Does that blue go with that red couch? Yep, it sure does... And the only problem now is I was just not feeling those curtains... Poor naked window.. The ceiling looks great!! I wish now that I had smooth ceilings. It flows great with that red couch. I would have never thought it!!! Do you ever stop??? You amaze me! It looks awesome! Lovin the blue and the red couch...but the windows are a bit nekkid! Wow, totally loving the blue ceiling! Did you paint it yourself? Being the resident painter of my house I know what a chore it is to paint ceilings, my neck and shoulders are hurting for you! Amazing results though, definitely worth the effort. Have a wonderfully blessed week! Wow! The ceiling looks great! That is something I haven't thought about doing! Mornin' Susie! 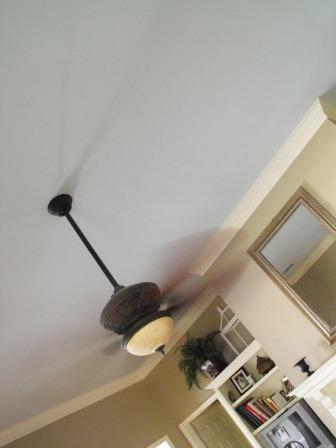 Oh, your ceiling looks wonderful and how I love that soft blue color. 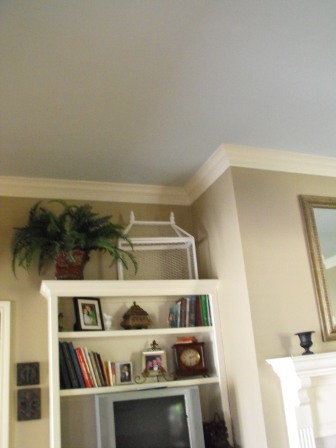 Wish I could do something like that - I have the nasty old popcorn ceilings! Ugh! Love that red sofa too! Don't feel so bad, I'm curtainless too! I'm so glad you stopped in yesterday. I think you would really enjoy those sweet books. Your ceiling is fab! I like it alot. We are re-painting our kitchen/dining area right now but it will be STARK white. Our house is soooo small and not wide open like yours so we have to grab the light...althought we did do our front room ceiling an off green color and it looks great. 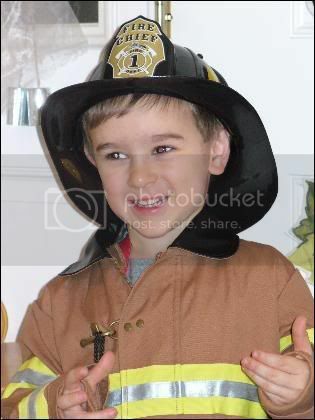 Your sure are a busy girl.....I hardly have time to breath right now it seems. HA! Susan, that looks great. The only problem, is now you have me thinking too. My husband will not be as thrilled about this as me. LOL... It was a great choice to spice up that ceiling. It made the moulding pop and that light fan pop out so much. Great job. Isn't painting so fun. My master bedroom ceiling is blue...and I love it. When I wake up in the morning I feel like I am looking up at the sky. So refreshing. The reflection from the lake also bounces around on it. If you will look at the picture that is by my bio and is attached to my comments, you will notice the ceiling. I sure hope you took some meds. after painting it. 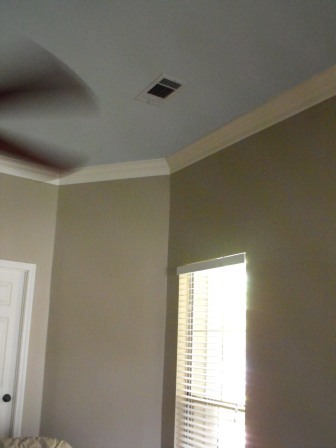 Ceilings and toilet areas are the hardest to paint. Once again...you have such wonderful ideas. What a big project but it looks GREAT!! I don't think I would have the nerve to do that but seeing yours turn out awesome I just might. :) Now the hard part...convincing my husband! That is brave, and it looks so good. I live in a 80's ranch with textured ceilings. oh how I wish I had flat ceilings. The tassels are great. Could you specialize some colors for me? I love the roosters and birds. That looks wonderful--such a soothing soft shade of blue, too. Oh I love it...what is the color on the wall?? 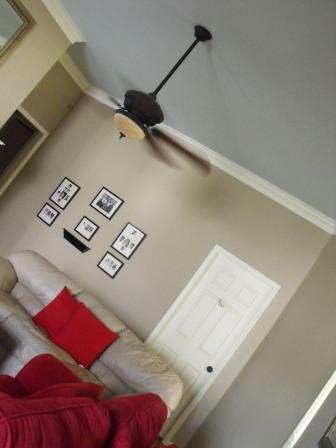 I love the painted ceiling...and of course, the blue goes with the red sofa!!! See you at the TEA tomorrow!!! Love how the ceiling turned out. Don't you just love it when a project turns out right. I'm fussing over a project right now that isn't working. :-( Also love that crown molding. Did you put that in? That turned out so beautiful. Did you paint it?? I never would have thought of blue. I see your new conservatory sitting up there looking great!! Thanks for sharing. I love the blue ceilings! In fact I was contemplating painting ours. It looks great! I love it. 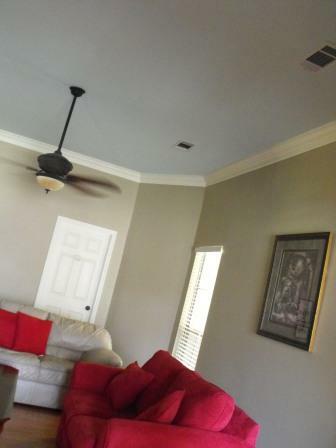 I am just scared silly to paint our ceilings another color other than white. I fear it will close the room in. Can't wait to see your new window treatments!! Thank You so much for stopping by and for your kind words. My husband read each and every comment and he was overwhelmed. It really meant a lot to both of us. Susie--Great job!!! I love surprises on the ceilings. Such an overlooked piece of a room. 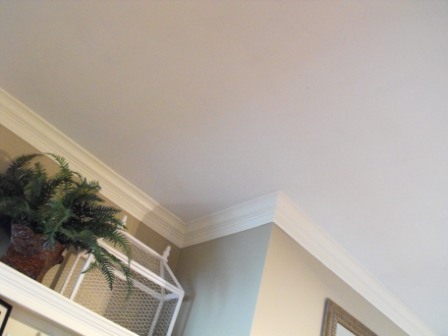 Most of the ceilings in my house are a different color other than white. I think it adds another layer of interest. But I HATE painting ceilings...my neck hurts just thinking about it! I am so loving the blue ceiling. What a difference it makes. Good for you for trying something new! I just opened the box and it's perfect! Wow, you shipped it fast. Thank you, thank you, thank you! I read that your going to make Fall and Christmas tassels as well. I can't wait to see those. I love how it looks! And that blue is a shade that will blend with anything. I have the white popcorn ceilings in my garden home. The first of that will be gone this week as they start to renovate the master bath. Thank goodness! Who invented popcorn ceilings? Yuk! Now I want them all painted too! Looks great! Do you hire out, my bedroom ceiling needs a coat and I am DREADING it. Wow, it looks awesome. 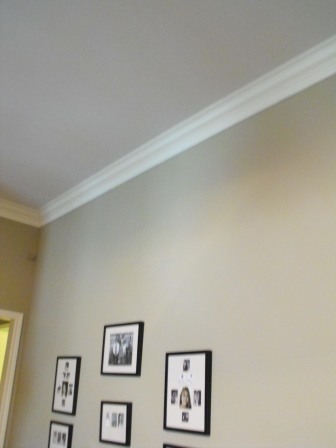 I'm such a wimp, I would have never thought to paint a ceiling a color besides white. You did an awesome job. I love, love, love it!!! It is the perfect shade of blue! Boy, do you have an eye for color! If I did it, it would turn out neon. And we'd have to wear sunglasses. And I'd hate it! Hi Susie! I love your blue ceiling and I think the colors work beautifully together! My ceilings are all white and I've been thinking about trying some color too. I just hate painting ceilings! 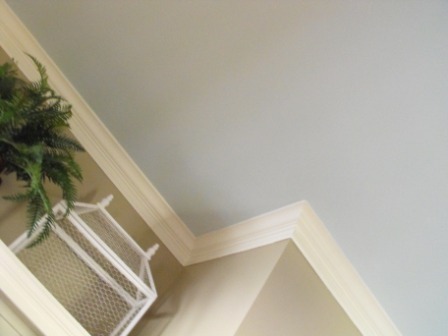 Love the blue ceiling and I love Hooked on Houses too - what a fun blog! Now I need to see what you are going to do for curtains. I've lived her 4 years and still no curtains in my family room, can't decide! Wow that looks great! The blue looks like what I have in my master bedroom I just may have to reverse it and put it on the ceiling. Susie...it's beautiful! 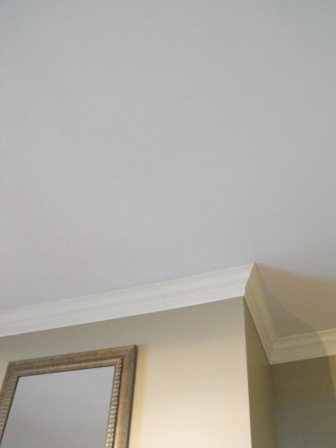 Ceilings are the most difficult to paint since it is all about over one's head! Soreness I'm sure. I'm in the midst of my painting marathon, taking a break with paint covered hands! Great idea painting the ceiling. It looks great! LOVE the blue ceiling! And it looks so nice with the walls and the couch! Wow, 44 comments on this one! You have lots of friends! :) Just wanted to say I'm WAAAY behind. First time I've checked in, in a LONG time...just wanted to say hi and let you know I love hte pics of your table, ceiling, backyard, and Happy Bday Madison! Oh, and are those birds finches? We had finches growing up.... we named them Barbie and Ken... LOL! We had funny names for all our animals...our gerbals (sp??) were scratch and sniff.. So, are you working on curtains for it now??? Can't wait to see what you come up with!